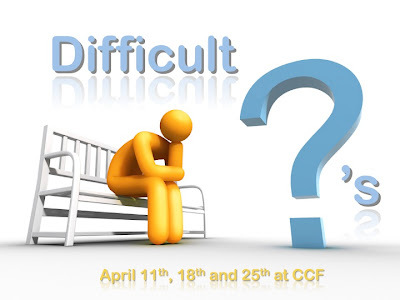 A few weeks ago I posted a Blog about the next sermon series that we will be launching at CCF the Sunday after Easter. You can read all about it by clicking here! Head to the CCF Website and click on the large visible link at the top of the home page. Type your question in the box and click "shout." Visit our Welcome Center at the church, grab a question slip, write your question and drop it in the box. We are really excited to take a few Sundays to focus on questions and needs that are felt and real. Trusting the Lord to use this vision to make a difference. We hope you will participate. By the way-- feel free to submit questions that other people have asked you that you did not have the answer to.